We propose a new non-orthogonal basis to express the 3D Euclidean space in terms of a regular grid. Every grid point, each represented by integer 3-coordinates, corresponds to rhombic dodecahedron centroid. Rhombic dodecahedron is a space filling polyhedron which represents the close packing of spheres in 3D space and the Voronoi structures of the face centered cubic (FCC) lattice. In order to illustrate the interest of the new coordinate system, we propose the characterization of 3D digital plane with its topological features, such as the interrelation between the thickness of the digital plane and the separability constraint we aim to obtain. 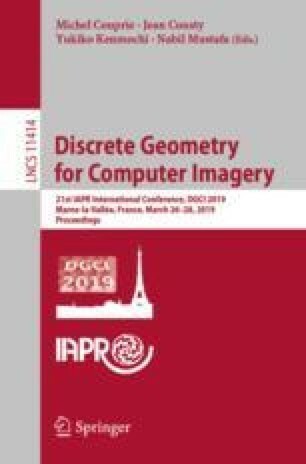 A characterization of a 3D digital sphere with relevant topological features is proposed as well with the help of a 48 symmetry that comes with the new coordinate system.